In a Dutch oven or soup pot, heat the EVOO, 2 turns of the pan, over medium heat. Add the leeks, celery, bay leaf and salt and pepper to taste and cook until the vegetables are softened, about 5 minutes. Add the chicken broth and bring to a boil, about 3 minutes. Stir in the cream, lower the heat and simmer until the soup bubbles at the edges. Add the chicken and gnocchi and cook for 5 minutes. Remove the bay leaf. Stir in the parsley, sherry, if using, and paprika; serve hot. In Recipes-list.com we have selected the most viewed recipes from category - uncategorized . Enjoy the best recipes specially selected for you! 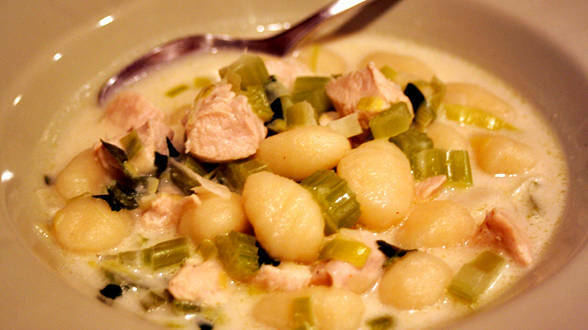 Leeky, Creamy Chicken-and-Dumpling Stoup is the right choice that will satisfy all your claims.